The Philadelphia Phillies have signed 17-year-old German outfielder Julsan Kamara to a seven-year minor league contract. He will join the MLB organization after finishing school in the spring of 2014. He is currently playing for the farm team of the Buchbinder Legionaere Regensburg in the second division in Germany. He had joined the baseball academy in Regensburg in September 2011, coming from the Mainz Athletics. Kamara was one of the German players at a MLB tryout in Mainz last week and apparently impressed the Phillies that much that they signed him quickly. 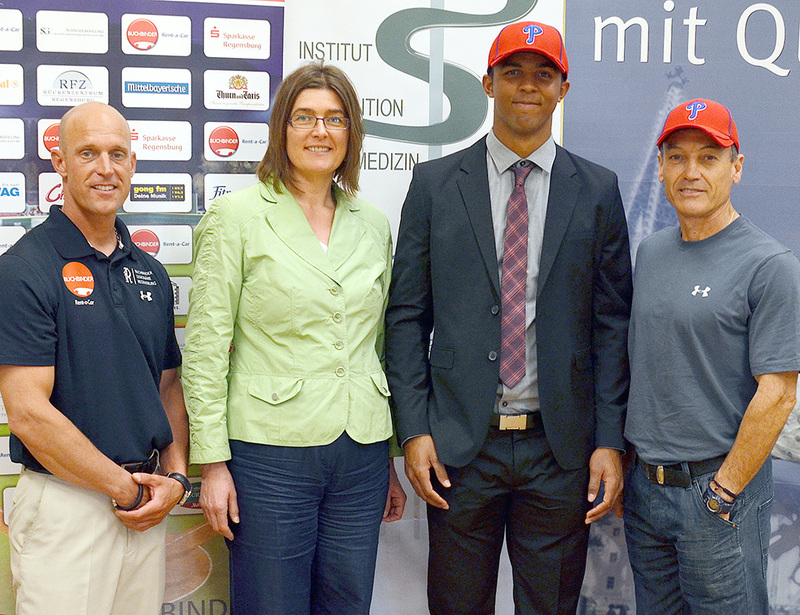 He already attended the MLB European Academy in Tirrenia, Italy in 2012 and has been considered one of the best prospects in German baseball. He is a member of the German Junior National Team and participated in last winter’s Power Showcase at Marlins Park in Miami, Florida. “To become a professional baseball player is my greatest dream.”, said Kamara according to a press release sent out by the Buchbinder Legionaere on Monday. After Donald Lutz (Cincinnati Reds), Kai Gronauer (New York Mets), Max Kepler, Markus Solbach (both Minnesota Twins) and Daniel Thieben (Seattle Mariners), Kamara is becoming the sixth current German player under contract with a MLB organization. He also is the eighth player to sign out of the academy in Regensburg after Rodney Gessmann (GER, 2006 with Twins), Ludwig Glaser (GER, 2007 with Los Angeles Angels), Lutz (GER, 2007 with Reds), Mike Bolsenbroek (NED, 2008 with Phillies), Jakub Sladek (CZE, 2008 with Phillies), Kepler (GER, 2009 with Twins) and Thieben (GER, 2011 with Seattle Mariners). Lutz became the first to reach the big leagues from this group, writing history as the first German MLB player.